Please see ‘Diary dates’ for details of our forthcoming AGM which will be held in Battle on 27 March 2014. This year’s reserve open days and events will also be posted on the ’Diary dates’ page from early April. Please visit our Diary Dates page for information on our guided walks and moth events for 2013. We hope for a good spring and summer and look forward to seeing as many members as possible out on our reserves enjoying these events. Our wonderful reserves have an abundance of wildlife thanks to the important management work carried out by our dedicated reserve managers and volunteers, and the walks will provide a chance to see and have explained how the wildflowers, insects and birds etc. are all benefitting. The moth events should give close-up views of some of the otherwise unseen night shift! Please don’t hesitate to bring along friends, relatives, or neighbours too - all will be most welcome! 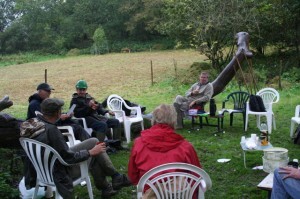 Volunteers’ fun days at Rotherfield reserve! 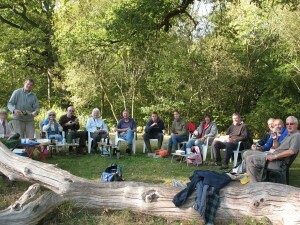 Annual haymaking at our Rotherfield reserve is surely the most important day of the year for our volunteers. 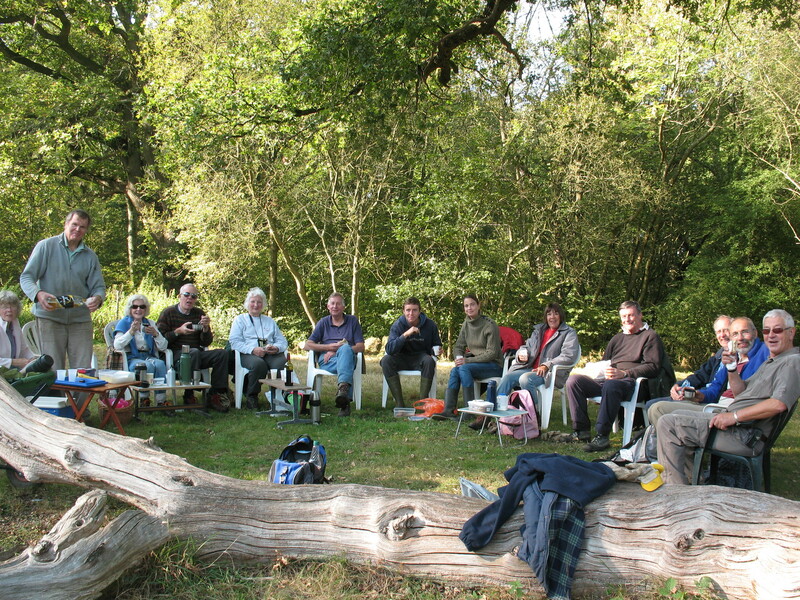 This also has to be one of the most fun days of the year for members and friends alike, seen here between tasks enjoying a picnic lunch in the October sunshine of 2011 (click on photo to enlarge). 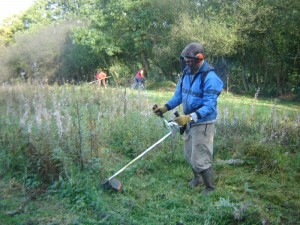 Where better to spend an autumn day than in the beautiful surroundings of our Rotherfield reserve meadows doing a bit of cutting and raking to help ensure the grasslands flower just as profusely the following summer? A visit to the reserve in late spring or summer is also highly recommended to see the fruits of everyone’s labours when the meadows literally buzz with life and are at their very best. (Open days will be announced in spring). Extra special thanks are due to everyone who helped with the haymaking in the slightly damper conditions of autumn 2012, which turned out to be just as much fun! Even Derek on strimmer duty seemed to think so (click on photos to enlarge)! This webpage has some excellent information and advice on whether we should be worried about it, what we can do if anything, a useful video on how to recognise the symptoms, and also how to report it if you find the disease. Although it is getting rather late in the year to find obvious leaf symptoms (now that the leaves are falling), if anyone does suspect a diseased Ash tree on any of our reserves would they please get in touch straight away by emailing me at ralph.hobbs@tesco.net or by phoning 01424 752878. 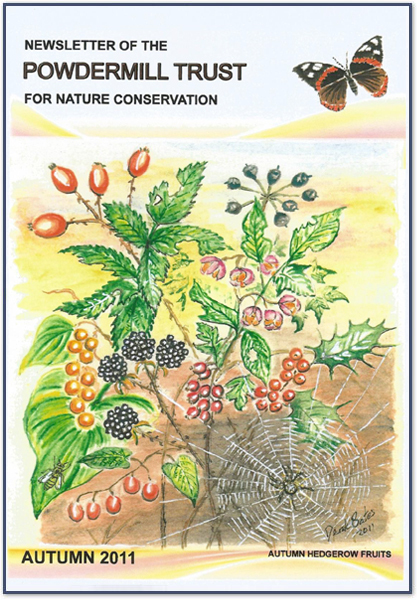 We will be making careful checks ourselves next year once the leaves are back on the trees, and if it is found will have to decide on any course of action then, taking account of the latest available scientific advice. Annual subscriptions may now be paid online! Your annual subscription may now be paid online using the secure PayPal donation facility on our website. Please press ‘Donate’ then you can use either your credit card or your own PayPal account to make a payment. Your online subscription or donation goes directly to the Powdermill Trust’s dedicated PayPal account. Amounts received of £10 or £15 we will assume to be subscription renewals, whilst any other amount we will assume to be a most generous donation! Please note that new members are requested to first provide contact details using the ’Become a member’ form on our home page, and await acknowledgement from the Trust. 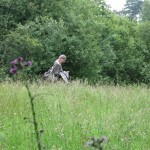 Last Saturday [7 July 2012] I joined renowned entomologist Peter Hodge for a day of insect surveying at our Rotherfield reserve. The weather could have been a lot better, but there were only a couple of brief light showers, and we were even treated to a glimpse of sunshine! We concentrated on the meadows and woodland edges, sweep-netting the grass and using a beating tray under low hanging branches, and after about 5 hours Peter had identified a highly respectable 45 species of beetle plus a good number of other insects. You can click each photo to enlarge. Butterflies included Meadow Brown, Ringlet, Large and Small Skippers, and one Comma caterpillar (on nettle), and we found 3 species of grasshopper (Meadow, Field, Common Green) and 2 species of bush-cricket (Dark and Roesel’s) all still in the nymph stage. We also saw one Common Shrew. Peter will be sending me his full list in due course, and the highlights will appear in our next newsletter. 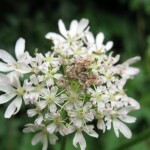 UPDATE 1/10/12 – The full report is now available to view or download by clicking here Rotherfield Insect survey report No. 3, 2012 It is called No.3 because Peter’s original 1997 survey was written up in two separate reports numbered 1 and 2! 21 Macro-moths - Lobster, Clouded Silver, Elephant Hawk-moth, Poplar Hawk-moth, Pebble Prominent, Large Yellow Underwing, Beautiful Golden Y, May Highflyer, Heart and Dart, White Ermine, Orange Footman, Garden Carpet, Flame Shoulder, Treble Lines, Common Swift, Ingrailed Clay, Great Oak Beauty, Marbled White-spot, Middle-barred Minor, The Shears, Mottled Pug. 7 Micro-moths, comprising 3 of the Pyrale family – Udia olivalis, Scoparia ambigualis, Chrysoteuchia culmella (=Garden Grass-veneer), and 4 others – Large Fruit-tree Tortrix, Green Oak Tortrix, Aleimma loeflingiana, Nematopogon metaxella (a golden ‘longhorn’ moth). 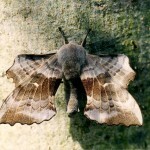 24th June 2012 at 9am – Moth Night at the Rotherfield reserve is this Sunday morning. Please come along! 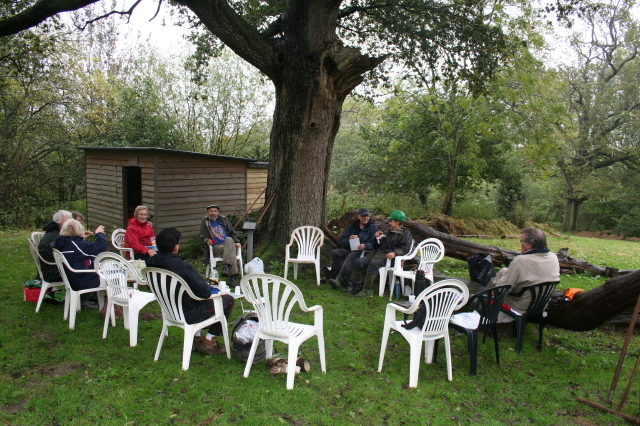 After the event we will post a list of the moths recorded HERE – watch this space! 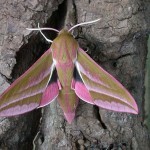 The nationally co-ordinated ’Moth Night 2012′ returns this year, and we will be moth trapping at our Rotherfield woodland reserve to mark the event. Dusk falls rather late in June so this year’s public event will take place on just the morning after, having run the moth trap all the previous night. At 9am on Sunday 24th June you are invited to view the opening of the trap, and to take a close look at the beautiful moths of the reserve at your leisure. Most moths are much more docile in daylight making them easier to admire and to photograph. You are welcome to bring your camera! NO NEED TO BOOK – JUST TURN UP! Children are especially welcome accompanied by an adult, but sorry no dogs. 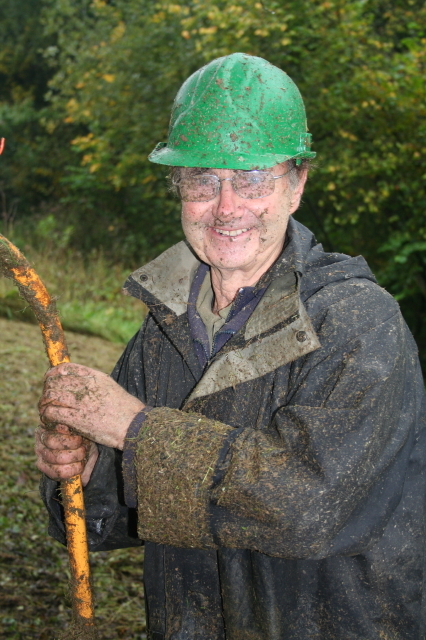 Please wear appropriate footwear as the grass may be wet and some paths a little slippery. If it is wet in the morning, bring an umbrella, as we will still be there! The Rotherfield reserve car park (Grid Ref TQ556291) is at High Cross on the B2101 road to Mayfield. From the Rotherfield direction it is on the left-hand side about 150m after you turn left to Mayfield. For further information please contact Ralph Hobbs on 07763 151787. 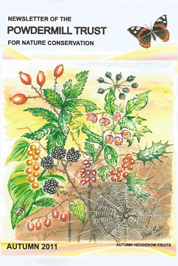 Our autumn 2011 newsletter is available to view on line.